Hi, I'm Whiskers - Reduced Fee!! 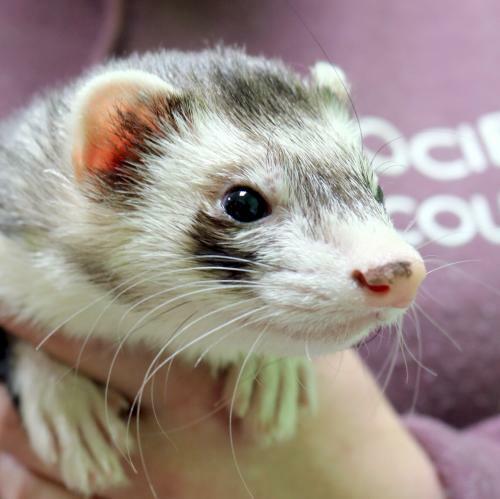 I'm a 1 year old neutered male sable Ferret. I'm a sweet and friendly ferret who likes to be held and petted. My best friend Snowflake and I are closely bonded and we're looking for a home together. Snowflake is just as nice as I am, so we make quite a delightful duo! Ferrets need a large cage and specialized care, so please do your research to make sure you can keep us healthy and happy. We also need to spend lots of time outside of our cage everyday so we can exercise, play, and snuggle with our person. We're looking for a responsible and committed adopter who will make us a priority in their life! My adoption fee is $25.00 and I must be adopted with Snowflake.